New Paltz, New York: Ann Lovett, 2004. Edition of 17. 6.5 x 4.5"; 42 pages. Pigmented inkjet print on rag paper. Spiral bound with red silk-cloth soft cover. 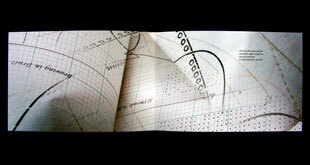 Laser printed antique map endsheets. Text excerpted from Hill's French-English and English-French Vest-Pocket Dictionary by Prof. C.M. Stevans (1898). 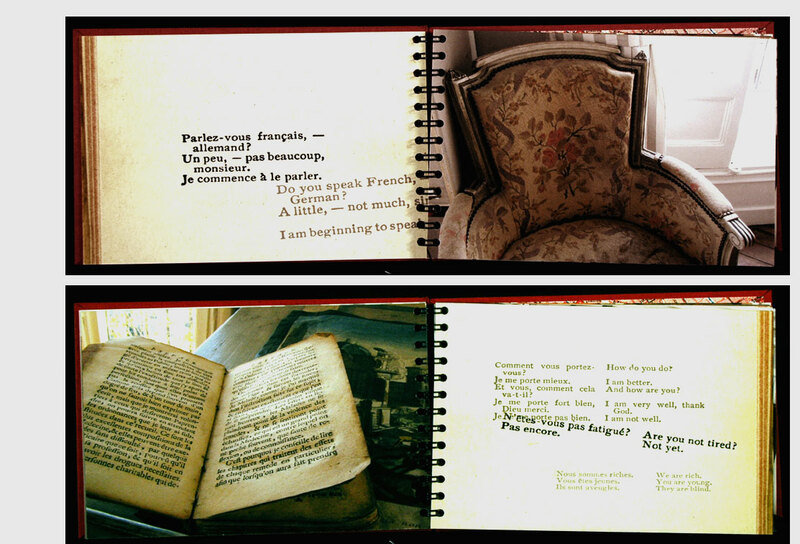 Ann Lovett: "Lingua Franca documents the Paris apartment where returned for many years, and is an intimate reflection on travel, language, and culture. When I came back from my last visit, a friend said to me, ‘I can’t wait to see your pictures of Paris.’ I had no photographs of Paris streets, museums or other sites to show her. Instead I had only made pictures of the inside of this apartment. When I stay in Paris I stay in someone’s home, and the first time I did this I was startled by the feeling that I was stepping into someone else’s life. I was trying to learn to speak French, struggling with my feelings of awkwardness, both with the language and with the culture, trying to fit myself into another life. The texts here come from a copy of an English-French phrasebook from 1835 that I found in a used bookstore in Rochester, NY. I found some wonderful odd things in it. If you ever need to know how to say “The objects near us seem to pass by us with extreme rapidity” in French, this is just the book for you. A narrative about traveling seemed to emerge from these phrases, one that expressed the doubts and fears of solo travelers, the polite forms of social interaction, and the fatigue of sightseeing and adjusting oneself to a new environment. I enjoy the irony of making a purported travel book that does not show the sights, the people, or the environment. "It’s instead a view looking inward, a reflection of the emotional experience of being in this place, and the process of constructing memory." New Paltz, New York: Ann Lovett, 2004. Edition of 10. 3 x 6.5"; 16 pages. 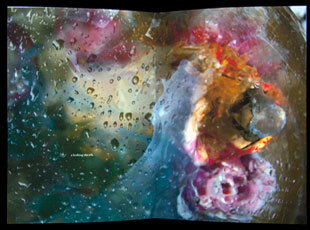 Pigment inkjet print on rag paper. Fabric covered dos-a-dos binding. Mulberry paper endsheets. Ann Lovett: "Combining two small books back to back in a dos-a-dos binding, Such Dreams/Scar explores the twinned experiences of desire and loss. Using the tumult and beauty of the natural world as a visual reference point, the book presents the artist's reflection on love, where intense feeling brings with it the risk of great pain." New Paltz, New York: Ann Lovett, 2010. Edition of 12. 8.25 x 5.5 x 1.375"; 84 pages. Pigmented inkjet print on rag paper. Drumleaf binding with breakaway spine. Bound in cloth covered boards. 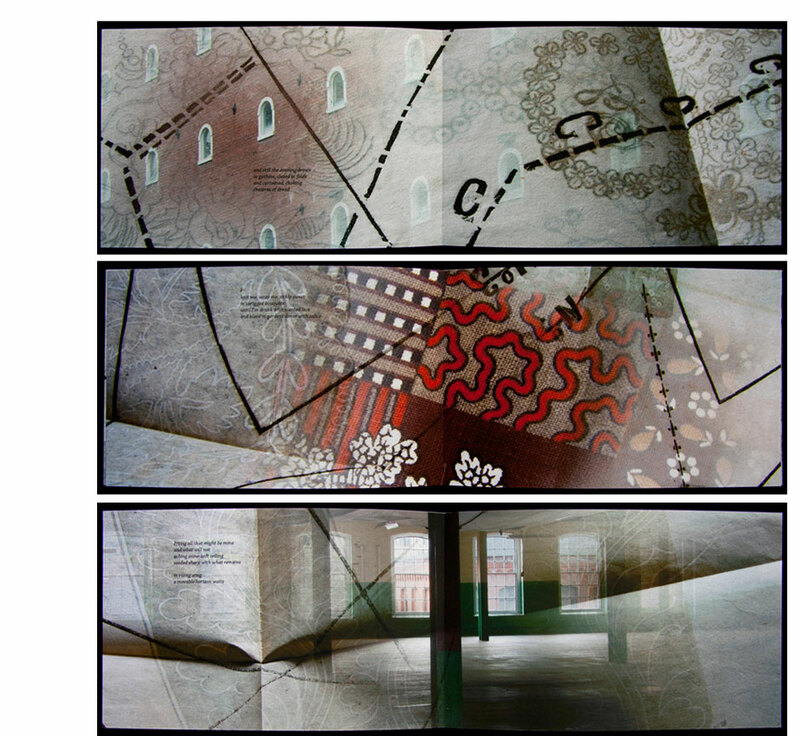 Ann Lovett: "A Movable Horizon investigates the life of a fictional 19th-century 'mill girl' working in the textile industry in Massachusetts. Changes in family and rural life, economic independence, urban experience, and the early labor movement are interwoven in images and a book-length poem describing the character’s inner life, her relationship to her work, and her desire for independence. "Photographic composites layer letters, documents, textile pattern books and dress patterns from the collections of the American Antiquarian Society with photographs of factory structures and architectural details from Lowell, Massachusetts." New Paltz, New York: sunburn editions, 1997. Open Edition. 5.25 x 6.5"; 54 pages. 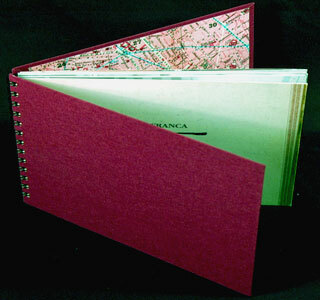 Laser printed, spiral binding with cloth covers. Photography. 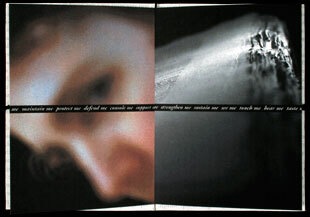 Into Focus / Art on Science Exhibition (1998): "Is science wholly objective? Should it be? 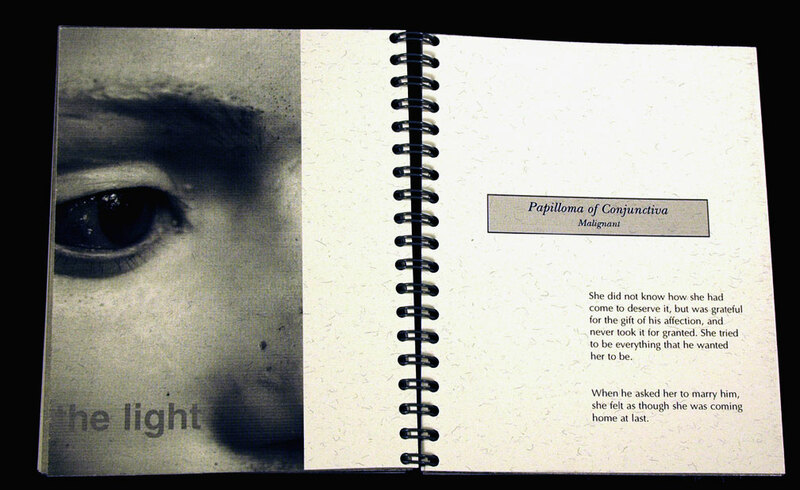 Ann Lovett's chilling book Sight Unseen places side-by-side clinically titled photographs of eye afflictions and the story of a woman whose lover blinds her. This is not an indictment, but certainly underscores the cool detachment of medical science." Afterward: "This book is based on the true story of Linda Riss, who was blinded when Burton Pugach, the man she had been dating, hired three men to throw lye in her face. He was convicted and served prison time for his crime. She married him when he was released and lives with him today. He was recently acquitted of charges that he had sexually abused and threatened to kill the woman with whom he openly admits having a 5-year affair. His wife testified as a character witness for him, saying that he was 'a wonderful, caring husband.'" "This book is neither a condemnation nor an endorsement of the actions of this or the many other women who stay in abusive relationships. Rather it is an examination of the frightening power of human loneliness and need. "The photographs in this book show a series of wax models depicting various diseases and injuries of the eye. They were purchased in 1882 from Tramond of Paris, and are part of the collection of the Mutter Museum of the College of Physicians of Philadelphia." New Paltz, New York: Ann Lovett, 2006. Edition of 16. 3.9 x 5.75"; 48 pages. Pigmented inkjet print on rag paper. Coptic binding sewn through accordion-pleated sheets. 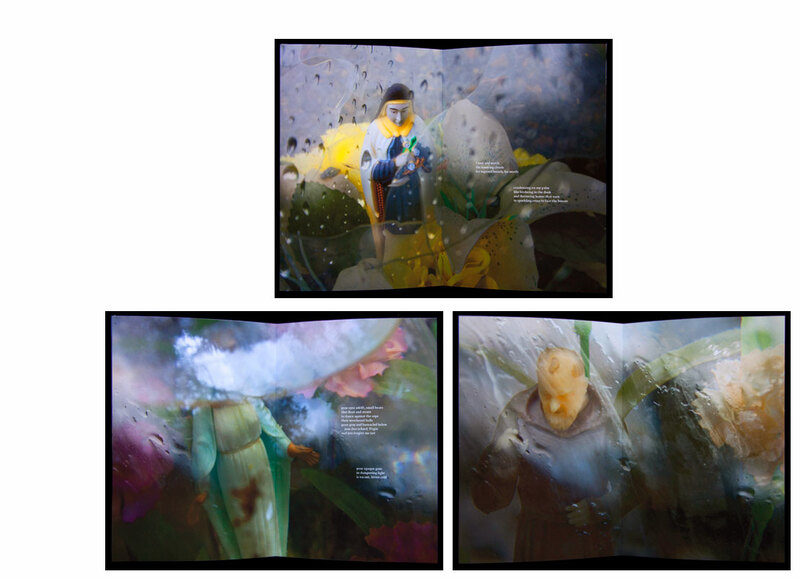 Rice paper endsheets. Bound in green silk-wrapped hard covers. Ann Lovett: "The title, with obvious reference to the souvenir, means to remember in French. Se Souvenir is about Normandy, France, and the memorials and beaches commemorating the D-Day invasion during the second World War. It’s also about Max, my ex-father-in-law, whom I never met. 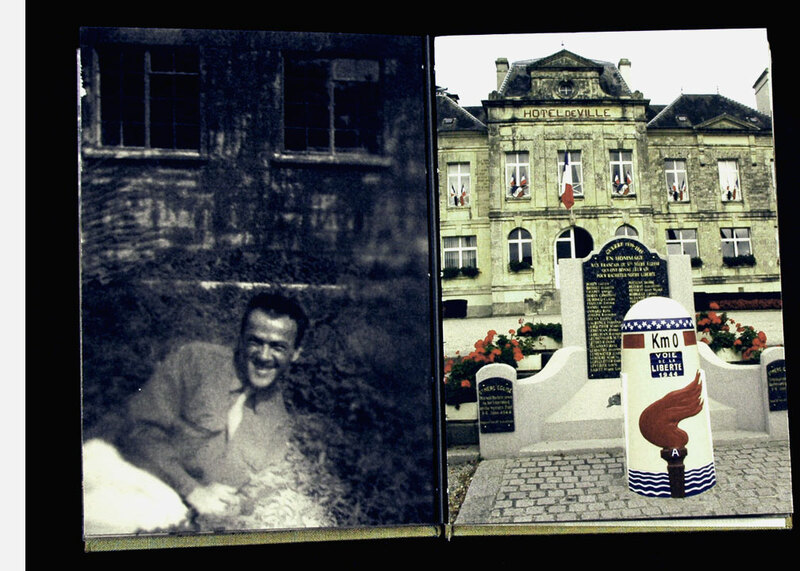 He was wounded in the second wave of the invasion and survived, and the old photographs are of him as a soldier. "The photographs of Max maintain the fiction that all is well, presenting a smiling uniformed soldier who looks healthy and whole. Like most family photographs, the agenda here is to show life as you want it to be, orderly, stable, rich with family and friends, and service to country, not necessarily as it is. Little in these pictures speaks of the horrors of war, what he must have seen, or the fear he must have felt. For my generation, these 'memories' are constructed from the stories our fathers told us, or more often from the imagery of Hollywood films, images of courage and heroism, and perhaps for Americans the last righteous war. For the residents of Normandy that history is very much alive. It happened in their towns and in their backyards, and though those who experienced it are dwindling in number, the memorials and the memories of heroic liberators are enmeshed in everyday life. Although there is little evidence of the damage of war in Max’s photographs or in the sparkling sands of Utah Beach, it is evident in the bruised landscape, still scarred in a few places by bomb craters, remnants of bunkers, and of course cemeteries, where French, American, British, and German soldiers are all buried. "In Se Souvenir I am interested in creating a kind of visual poetry in how the images both resonate and collide with each other. To that end, in some page spreads the images flow together at the horizon line, while in others there is a discordant juxtaposition of space and form. "There’s both continuity and tension between beauty and damage, between past and present, and between what appears to be documented and what we think we know. For me this book is also about the scars that don’t show, seeing Max’s war experience reverberate into his children’s lives. And perhaps it’s in part about my own father, who was a Conscientious Objector during this war, and who still weeps sometimes for those who died." New Paltz, New York: Sunburn Editions, 1999. Edition of 200. 13.25 x 4.75", opens to 56”; 10 pages. Vertical concertina with orange silk-wrapped hard covers with flags, hard covers. Two-color offset lithography printed on Mohawk Superfine paper. The structure is loosely based on the Surrealist parlor game, "The Exquisite Corpse," in which several players draw on folded paper to make a composite drawing. The type is New Century Schoolbook, Gill Sans, and Garamond Italic. Ann Lovett: "In a time when genetic engineering and the sexual behavior of public figures dominate public discussion, the body continues to be a contested site in Western culture. As a result, the human image in contemporary art and culture is positioned at the highly charged intersection of the personal, the moral, and the political. As the technological demands of medical science increasingly dominate the public sphere, the traditional roles of religion and community as arbiters of social and moral choice in contemporary society have been supplanted. At the same time, the Cartesian privileging of mind over body and the intellect over lived experience has led to the primacy of scientific methodology and a consequent discounting of sensory experience and the voice of desire as sources of knowledge. No matter how much the body is culturally controlled and proscribed, it asserts its wayward and illogical nature; its inherent messiness and temporality ultimately defy classification and control. It is here where the insistent presence of lived experience and the voice of desire come up against and intertwine with the search for analytical explication and control that the most interesting territory is to be found. 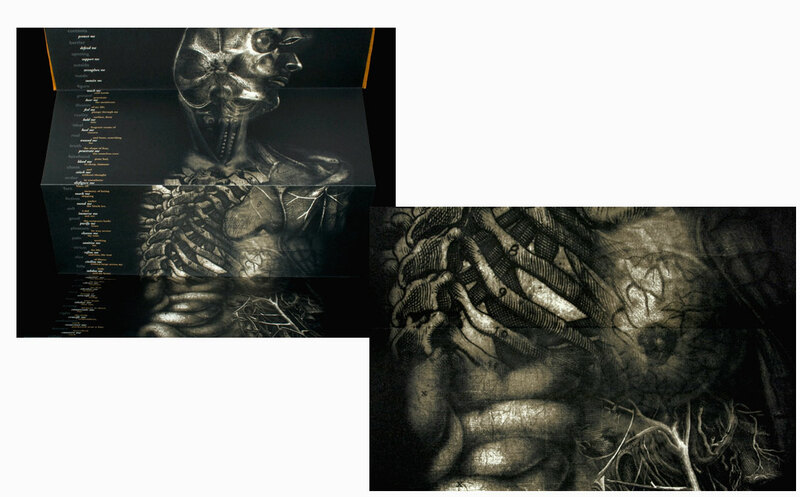 "A composite of medical images and interlacing texts describe the attempt to find clarity in the intricacies of physical and emotional experience and to reconcile those experiences with the analytical descriptions of science and medicine. 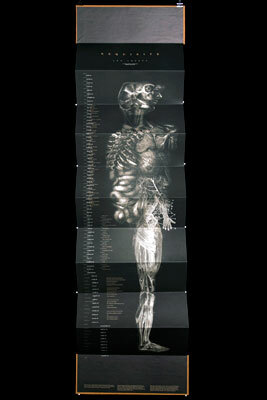 The accordion format and composite figure are reminiscent of ‘exquisite corpse’ drawings, where each participant draws a section of the body without looking at others’ drawings. I chose this format both to refer to this game popular with the Surrealists, and to reflect on medicine’s fragmented and mechanistic view of the body." New Paltz, New York: Sunburn Editions, 1998. Edition of 26. 4.25 x 6" closed, opens to 72”; 16 pages. Inkjet print on rag paper. 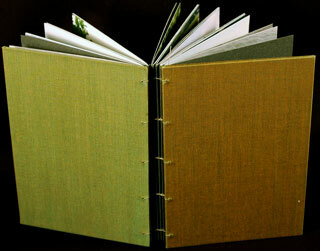 Accordion fold binding with printed paper-wrapped covers and ribbon ties. Ann Lovett: "Conundrum uses photographs, historical medical diagrams, and text to address the ways in which the body is framed by history, science, experience, and desire. Exploring the historic scientific text as a site which functions symbolically as the repository of intellectual knowledge, and the skin as sensor and instrument of desire, it questions the persistent paradigm of Cartesian mind/body division. Contrasting and intertwining representations of ‘objective’ scientific inquiry with those of physical experience, memory, and desire, the book raises questions about the nature of knowledge, what is and can be known about human experience, and how that knowledge has been framed historically. "Historical anatomy diagrams allude to the conceptual framework of the time in which they were made and the fluidity and instability of scientific knowledge. To look at these diagrams is to examine scientific, political, and social belief; images of the classified, organized corpus become metaphors for the belief that rational analysis can explain and control the individual self. By shifting them from the role of medical history into the context of art, from the classificatory and didactic to the realm of interpretive representation, I intend that readers will consider what kind of information is found here. These diagrams might be seen not only as a tool by which scientists in the past learned about the structure of the body, but also as a symbolic visual representation of a specific paradigm which continues to frame our view of physical experience. "Color images emphasize skin as the container of the body and the self, as the barrier which separates self from other, and as a cognitive tool for transmitting the sense of touch and perceiving the world. Within these multiple roles of containment and protection, exposure and disguise, pain and pleasure, the skin is in a state of constant renewal, recording aging, injury, and healing, the text of experience. These images give voice to the sensual and evocative body, the experience of vibrant, fluid physicality. "The cover text is a mirror image of Descartes’ treatise on the mind and the body." New Paltz, New York: Ann Lovett, 2009. Edition of 12. 6.5 x 9 x 1.25"; 68 pages. Pigmented inkjet print on rag paper. Drumleaf binding with breakaway spine. Bound in silk cloth covered boards. Ann Lovett: "Glass House explores the 1984 death of Ann Lovett, a young Irish woman with whom I share the same name. She was 15, pregnant and unmarried, when she was found dying from hemorrhage and exposure with her stillborn son in a grotto to the Virgin behind the Catholic church in Granard, Ireland. It is unclear whether her family or community knew of her pregnancy or offered any help. The family has never spoken publicly of her death, or of her sister’s three months later from an overdose of prescription drugs. The father of her child has never come forward or been identified. Three months before her death the Irish voted to support a referendum effectively making the existing ban on abortion part of the country’s constitution. "The book explores issues of vulnerability and protection, privacy and exposure, sensuality and the failures of Catholicism in her life. The glass house functions as a metaphor and is reflected as well in the subject of these photographs, glass domed grave decorations traditionally seen in Catholic graveyards in Ireland. Over time they become fogged with condensation, broken or half filled with water, obscuring the religious figures within and the faith they are intended to embody. The text is a book-length poem, written as though in Ann’s voice." New Paltz, New York: Visual Studies Workshop Press, 2004. 6x 7.8"; 80 pages. Ink jet print on rag paper. Laser print on vellum. 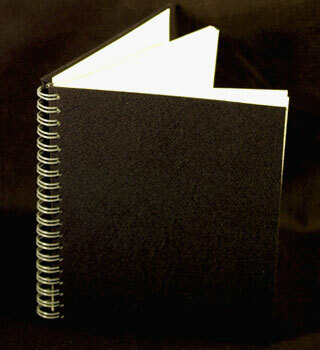 Hand bound in black cloth. 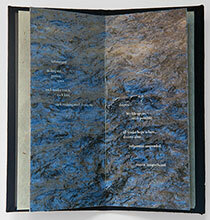 Ann Lovett: "Remains, a book that continues the exploration of pilgrimage and tourism that I began with Pilgrimage. Its subject is three former concentration camp sites that I photographed in Germany. The trip was in many ways also a pilgrimage for me, as it is for the several million people who visit these sites every year. Perhaps like me they feel the need to be physically present at these places, that some greater understanding, not of what happened, but of the fact of it, is possible through this physical experience of place. This book was an interesting and complex challenge for me, since so much has been written about the camps. I felt that it was important to speak not with an authoritative voice, but with a more visceral response to what I saw, to make something that carried my voice, with its questions and wondering. The book is in three sections, and each one opens with a list of words and a brief history of the camp. 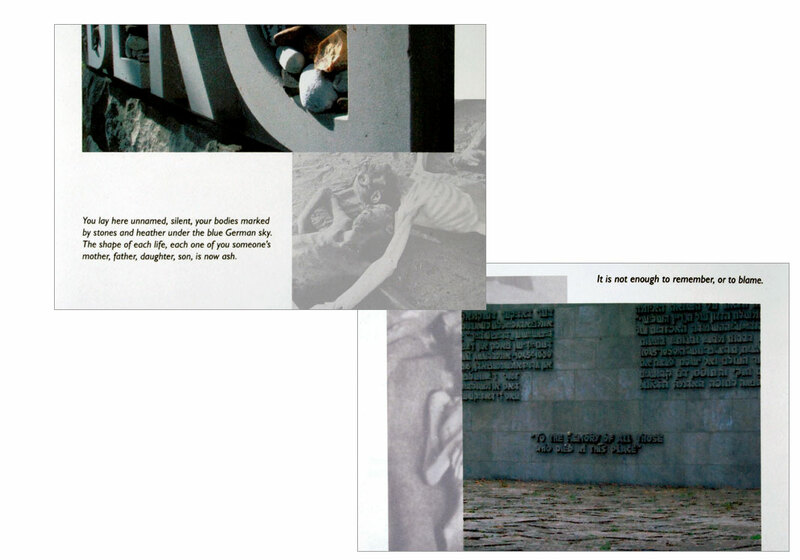 I used images from the US Holocaust Memorial Museum Photographic Archive depicting the camps at the time of liberation in the book, and layered them behind my contemporary images. This positioning speaks visually to the process by which individual experiences become obscured as official histories dominate the site. We know the stories and have seen Hollywood's version of the Holocaust, but the real stories are slipping away, sliding under the surface, as survivors dwindle and the metanarratives of history and ‘memorialization’ take over. "The first section is about Bergen-Belsen, which was primarily a holding camp, where prisoners were held for possible exchange for German POW's. When other camps were evacuated by the Germans in anticipation of the arrival of Allied troops, prisoners were moved to Bergen-Belsen, where thousands perished of starvation or disease. The buildings were burned to the ground by British troops who liberated the camp in 1945, to prevent the spread of typhus. It's a Jewish custom to leave a small stone on the headstone of a loved one when visiting a grave. This marks the visit and the importance of the memory of the dead in the lives of the living. At Bergen-Belsen these small stones were everywhere, and this clearly marks it as a site of memory belonging to the living. It is first and foremost a cemetery, where mass grave markers read ‘here lie 5,000 dead’ or ‘here lie 10,000 dead,’ and I wondered how many other bones lay under my feet. I thought about all those muted voices, how little we know about their lives, and how little we've learned from their deaths about making peace in the world. When you visit Bergen-Belsen, you are literally standing above the bones of those who died there, but they are also metaphorically obscured by the beautification of this place and its presentation as a tourist attraction. "The second section is about Mittelbau-Dora, a camp in central Germany. Prisoners were forced to labor here in an elaborate underground tunnel complex, constructing V2 rockets for the German Army. They lived in the tunnels, where conditions were so bad that the average life expectancy was 4 to 6 weeks. The camp was liberated in 1945 by American troops, who bombed closed the tunnel complex and destroyed most of the other buildings. Parts of the tunnel are now open, but a decision was made not to restore it, rather to leave it in the condition in which it was found on reopening. Few other structures remain, except a crematorium used for disposing of the dead, which is one of the few buildings to have been restored. Again I looked for the presence of individuals in this empty place, and the text is a list of prisoners' names that runs continuously behind the pictures, a kind of lament for those who are gone. I also deliberately cropped and placed images into the gutter to express loss and the anonymity of those whose names we do not know. 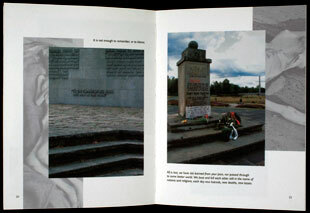 “The third camp in the book is Sachsenhausen, on the outskirts of Berlin, which has a more complex history. Established as a model for other concentration camps, it also became the administrative headquarters for the concentration camp system. Political prisoners were the first to arrive, joined later by those judged racially or biologically inferior. Slave labor, disease, starvation and systematic extermination were common here. Sachsenhausen was liberated by Red Army troops in 1945. After the war it became a Soviet prison camp, with conditions not all that different from those under the Nazi's, until it closed in 1950. The site remained under the political control of the GDR until the reunification of Germany. The manifestation of national and political ideology in how the site is preserved and presented was more apparent to me here than in the other camps. A Soviet monument was erected to honor political prisoners who died here under the Nazi's, and only recently were displays created that document the lives of Jewish and Roma prisoners. Original buildings and furnishings mingle with reconstructions, and the political agendas of control and display are numerous and overlapping. This is a staged authenticity, a postmodern pastiche of histories, ideologies, and constituencies. What should be preserved and what destroyed? What should be remembered and what forgotten? What is the task of interpretation and who should be its author?"